The ocean has been sucking up the heat-trapping carbon dioxide (CO2) building up in our atmosphere—with a little help from tiny plankton. 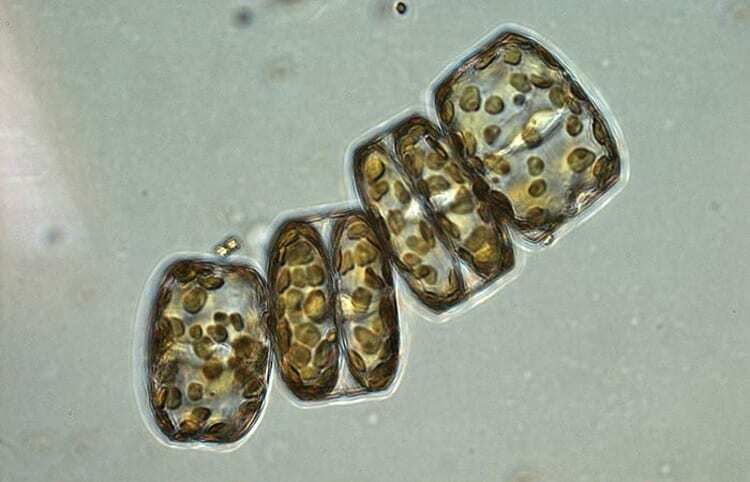 Like plants on land, these plankton convert CO2 into organic carbon via photosynthesis. But unlike land plants, decomposing plankton can sink into the deep ocean, carrying the carbon with them. It’s called the “biological pump,” and if it operated at 100-percent efficiency, nearly every atom of carbon drawn into the ocean would be converted to organic carbon, sink deep, and remain sequestered from the atmosphere for millennia. But like hail stones that melt before reaching the ground, some carbon never makes it to the deep ocean, allowing CO2 to remain at shallow depths and leak back into atmosphere. Graduate student Bethanie Edwards and colleagues discovered a surprising short-circuit to the biological pump. In a study published April 27, 2015, in the Proceedings of the National Academy of Sciences, they found that sinking particles of stressed and dying phytoplankton release chemicals that have a jolting, steroid-like effect on marine bacteria that feed on the particles. The chemicals juice up the bacteria’s metabolism causing them to more rapidly convert organic carbon in the particles back into CO2 before they can sink into the deep ocean. Scientists investigating what controls the fate of carbon in the ocean have explored many factors, such as how easily phytoplankton particles break down, how much carbon they contain, and how fast they sink. Typically, the detritus of phytoplankton have no special effect on bacteria; they are simply a food source, said Edwards, a graduate student in the MIT/Woods Hole Oceanographic Institution (WHOI) Joint Program in Oceanography. But the phytoplankton Edwards and colleagues studied—diatoms—are different. When stressed, diatoms release bioactive molecules known as polyunsaturated aldehydes (PUAs). The researchers found that these molecules kick the bacteria’s metabolism and CO2 respiration rates into hyperdrive—like skinny weightlifters after a steroid shot. The bacteria start devouring the falling particles like they are at an all-you-can-eat buffet. They significantly reduce the amount of sinking detritus while releasing more CO2. Molecules like PUAs are termed “infochemicals,” and Van Mooy said this research is one of the first to show how infochemcials affect what happens to CO2 in the ocean. Edwards, Van Mooy, and Bidle went to sea to collect and analyze particle samples from several locations across the North Atlantic, including the Sargasso Sea, the subarctic North Atlantic near Iceland, and the western North Atlantic near Massachusetts. The spatial coverage was important, Van Mooy said. “We know that there’s more sinking carbon in some places and less in others, so we wanted to understand the distribution better across different ocean regions,” Van Mooy said. To collect the particles, 6-foot-wide, funnel-shaped sediment traps were submerged 150 meters down (picture huge traffic cones dunked upside down in the ocean) for six to 24 hours, depending on how rough or calm the seas were. Once the traps were brought back to surface, the scientists incubated collected particles with PUAs and analyzed changes in bacteria’s respiration over a 24-hour period. 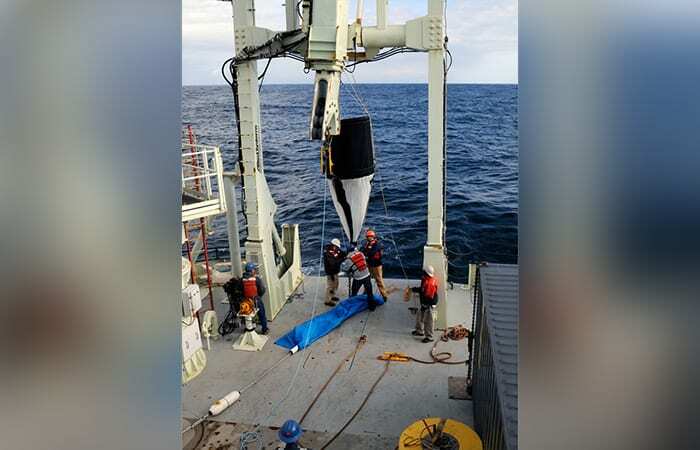 The scientists also found much higher concentrations of PUAs within the sinking particles than had been previously been observed in the water column. “This suggests that sinking particles are ‘hotspots’ for PUA production,” Edwards said. “These scientists have uncovered yet another nuance that may affect the efficiency of the biological pump to remove carbon from surface waters,” added David Garrison, program director for National Science Foundation’s Biological Oceanography Program. Long before delving into the nitty-gritty of marine microbes, Edwards majored in biology, sharing lectures with “a lot of nervous pre-med students” at Hendrix College in the landlocked state of Arkansas where she grew up. During college, she got her first lab job at the Mount Desert Island Biological Laboratory in Maine studying estuarine fish. “Bethanie had a neat background in both biochemistry and oceanography, which are the two types of expertise you need to do this kind of work,” Van Mooy said. She arrived at WHOI in 2010, shortly after the Deepwater Horizon disaster and was immediately put on a project examining how marine microbes consumed oil spilled in the Gulf of Mexico. The research was funded by the Gordon and Betty Moore Foundation, with additional support from the National Science Foundation and the Office of Naval Research.